But to come down from the high for a moment, it has occurred to me that I’m not really sure how to write a pseudo-19th century fashion plate description of these pieces. So, instead, I thought I would wax philosophical about accessories. In the real work, I am not a big accessories girl, but in the paper doll world, I just love them. Back when I was a kid, I had a paper doll book called, The Victorian Cat Family. It was an amazing paper doll book with literally thousands of fantastic tiny accessories all of which I painstakingly cut out. Oh, the memories… Still love that book. Anyway, I’m not the greatest artist when it comes to non-clothing items, but I try to spice things up with parasols, hats and shoes. Part of the fun of hats is that they change up an outfit. 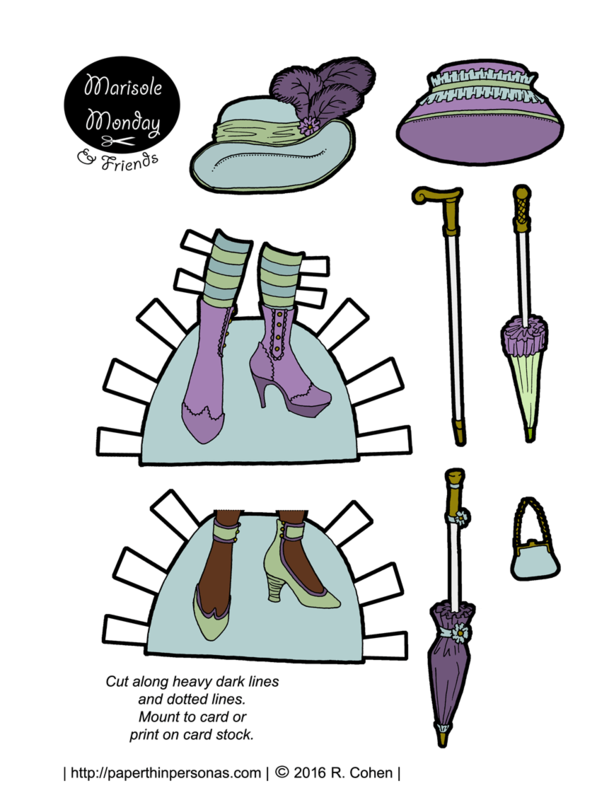 Also, I just love love love drawing paper doll shoes. If you missed Monday, you might need a doll to wear theses fun shoes. Here’s Monica all ready for her neo-Victorian wardrobe. I have two copies of the Victorian Cat Family…one cut out and one not. My daughter and I built the cats their own dollhouse. You’re right, a wonderful book. We still have the box o’dolls and all their stuff. A cat dollhouse would have been super cool! This Neo-Victorian week is so fun. Thank you! You’re welcome! I’ve had fun with it too. I have the Victorian cat family paper doll book too! It’s a wonderful book. I also had a Victorian mice book with lots of accessories I really loved too. Oh, yeah. I had the mice book too. It was amazing. The colors this week are really beautiful. Looking forward to seeing the wrap-up tomorrow. Thank you. I wanted things to mix and match if people broke up the outfits. I adore this set, because I’ve always loved Victorian fashion. One thing I’ve noticed in the fashion plates (or books) is that sometimes they showed a formal dress with another top that would work for an informal situation using the same skirt, so there was more versatility in a wardrobe. I think it would translate to a lot of different time periods and make it easier for you to make super versatile gowns and without having so much to draw. I LOVE this blog, just so you know. I like your new idea of a doll a week with different outfits per day, it draws out the excitement and is super fun!